At the beginning of the apparitions, Rosario was a 15 year old boy, being born in Catania on 22/06/1971. An only child, he happened to live in a well-to-do family, thanks to the thriving business of his father. In his childhood, there were no indications or presages of the apparitions. His entire scholastic and ecclesiastical career occurred at Catania, where his parents lived and where his father, who died not long ago, worked. He attended nursery school and first grade at the "Istituto delle Sacramentine". From second grade to the second year of high school he studied at "Leonardo da Vinci", a scientific high school, run by the "Fratelli delle Scuole Cristiane" ("Brothers of Christian Schools"). Then he enrolled in a classical education school, bringing high school to completion at the "Liceo Principe Umberto": and finally joined the Faculty of Letters at the University of Catania. But an experience of illness penetrates this rather common story. It was a mysterious virus-caused illness, which provoked persistent, debilitating fevers. Just when this disease seemed to become incurable, the supernatural manifestations began, on 04/05/86. The apparitions, strictly speaking, began on 11/05/1986, a Sunday, and finished on 01/05/1988. They were 32 altogether, and in the last of them the Blessed Virgin Mary foretold a thirty-third and last apparition, without giving the date. Having alighted on the rock, the cloud (which was shining, and of such a size as to enfold a person) began to open the same way a flower blooms, and at the same speed it veered towards the rock. While the cloud opened, the light of Our Lady started to gleam through, and it became so powerful that the brightness of the sun seemed to decrease, to such an extent that the sun looked like the moon looks in the daytime. At the same moment, one could hear that the voices more or less soft of the bystanders diminished, so that everything around me was still and silent. While opening, the cloud gathered on the rock, to form a sort of cushion between the rock and the feet of Our Lady. The cloud opened progressively, in such a way that first the head of Mary appeared (at that point I started praying "Ti saluto, mia Regina", that is "My greetings to you, my Queen"), and then her entire body, up to the feet. I couldn’t perceive anything around me; I had the impression that I was alone, and that only the Holy Virgin and the rock were present. The light of Mary was measureless, but this didn’t disturb my sight: on the contrary, it magnetized my eyes, making me want to look at her continuously and always. Before addressing me, the Blessed Virgin turned her eyes to the people, smiling; I think she took pleasure in looking at her children who had come to the site of the apparitions. After that, Mary lowered her eyes toward me, and started talking. Our Lady always appeared to me dressed in white. But this white was an extremely bright one, like the silvery reflections of the sun on a placid, crystal-clear sheet of water. Such an intense luminosity also caused the sky, the background against which Mary stood out, to change its usual color, and to shift from blue to the shades we see at dawn. The Mother of God always wore a white mantle that fell from her head down to her feet, covering her figure. The hems of her mantle seemed to be of gold. Her dress was made from a single piece of cloth, and her waist was tightened by a sash (which looked like gold) that, fastened by a single knot, hung below her knees. The right end of the sash was a little longer than the left one. The dress, with a simple round cut encircling her neck, and sleeves not too narrow at her wrists, fell softly on her feet, making delicate pleats on both sides of them, but without hiding them. The Blessed Virgin was barefooted, and you could see both her feet beyond her toes. They were placed on the cloud, which was very dense; you didn’t have the impression that Mary leaned on a vacuum or was suspended in mid-air. The complexion of the Blessed Virgin is light, a little rosier on the cheekbones. Her hair is auburn, but with a slightly reddish reflection, like the shades in chestnuts; it is slightly wavy, but I don’t know if it is long or short, since I never saw Mary bareheaded. Her eyes are intensely azure, they look like sapphires. Sometimes the sea assumes this kind of color, and, when it sparkles under the sun, it looks like, even though very distantly, the Blessed Virgin’s eyes. Her heart is dark red, encircled by many thorns entangled around it. The heart of Mary seems to be embedded in a thicket, and there’s a flame over it. Her entire heart emits a light that is intense, penetrating and all encompassing. Each time the Holy Virgin showed me her heart I felt myself imbued with that light, like a sponge plunged in water: I felt that light inside and outside of me. This sweet heart, however, did not appear to me on the outside of Mary’s dress, as many mistakenly think, but was so bright that it shone through the dress, which at that point was transparent like a veil. The Mother of God always carried a rosary on her right hand. The rosary beads were white like pearls, whereas the chain and the cross look like gold. Mary’s hands are not very big; rather, they are proportional to her body and stature (she is about five feet tall); they are neither tapering nor plump. Mary doesn’t look more than 18 years old." In the first apparition (11/05/86) the Blessed Virgin had "folded her hands with a rosary between them". In the apparition of 08/06/86, just after the disclosure of her name, "Mary opened her hands and stretched out her right arm, rosary in hand, as if an invitation to prayer, and bent her left arm slightly as a gesture of protection." Here Mary showed her heart. When Our Lady (01/12/86) spent an entire apparition to recite the holy rosary together with the visionary, "she began with the sign of the Cross". Then she took a new posture in comparison with other apparitions, making a significant gesture: "with her right hand she put the Cross of her rosary against her Immaculate Heart, while with her left hand she ran the beads through her fingers". On 01/02/87, at a certain moment of the apparition, Mary made a gesture like the one she made at Fatima in a similar situation: "She put her open hands near each other. From her palms an intense light shone, which fell to the ground in front of the spot where I was on my knees. I looked, and saw the ground had opened". Then the vision of hell followed. Many times the Holy Virgin came in tears, as Our Lady of Sorrows (see apparitions of 8/07/86 and 18/06/86). In the apparition of 01/04/88 she came as Our Lady of Sorrows, staying on her knees under the Cross, and invited Rosario to recite three mysteries of the Holy Rosary. This is the very moment the seer became aware, from a gesture of Mary, of "her interceding for us". "I noticed a beautiful thing: every time I said "Holy Mary, Mother of God, pray for us sinners", she lovingly raised her eyes toward the sky." "Ever since I have tried to describe Mary the way she appeared to me, many people wondered if in all her 32 apparitions the Holy Virgin showed herself the same way, that is with the right hand stretched forward, the left hand bent a little farther back and her Immaculate Heart clearly visible. To this question I have to answer no, since the postures the Blessed Virgin has taken in her apparitions are many. Nonetheless, I have chosen that particular posture because it deeply impressed me, and because it seems to sum up perfectly the message of the Immaculate Heart of the Queen of Peace. Indeed, even the gestures of Mary have a meaning, a language of their own, a message. To give an account of even the smallest gestures of the Blessed Virgin would be almost impossible; still, it is not difficult to recall the gestures most particular and recurrent. When Mary speaks of the Rosary, and recommends it as a very efficacious prayer, she hands it forward, and then she lifts it a little. Interpretation: she seems to present the rosary as an anchor of salvation, or as a powerful means to relieve the souls of everyday problems, or to raise them to the supernatural realities, or as a chain of love which ties men to God. 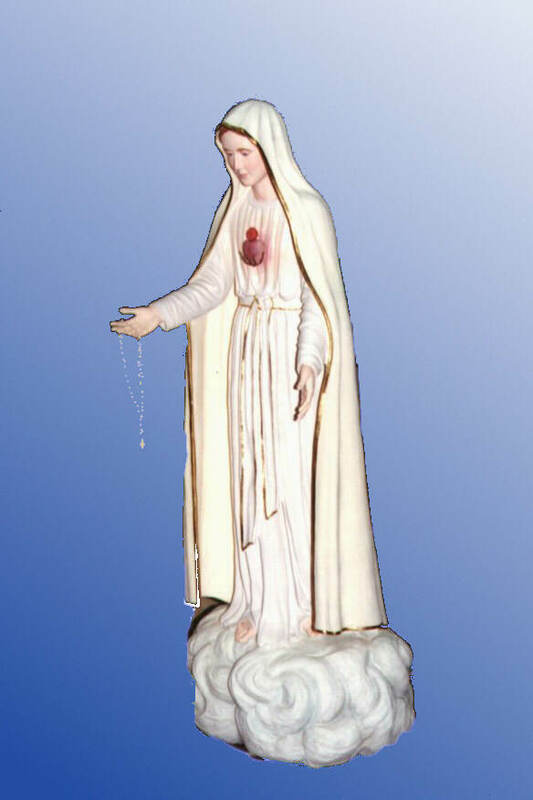 When she speaks of Her Immaculate Heart, she points to it with the forefinger of her right hand, the same hand with which she holds the rosary. In doing so she seems to show a safer way in our journey toward God: her Immaculate Heart seems to be the door to a secure refuge, the innermost abode of God’s love which dwells in her, a place where you have a more direct knowledge of perfect charity, a space where the soul abandons itself completely and is being transformed, molded and brought to perfection. It is important that the Holy Virgin shows her heart with the same hand with which she holds the rosary, because thus she means that prayer is the way to reach her Immaculate Heart. 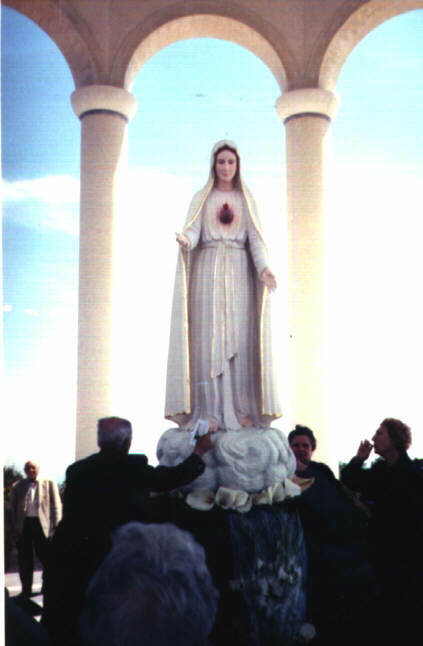 When, on 01/11/87, Mary said "I want them all to be saints, my dear children", she made a movement with both hands (as though she wanted to receive all people who were present on the lawn), and then laid them on her breast, one on the other and both pressed on her heart, as if her heart would be a very powerful means for sanctity. When, on 01/06/87, I asked Mary what we ought to do invoke the Holy Spirit, she replied: "Abandon yourself totally to me and my Heart: I am the abode of the Holy Spirit", accompanying these words with a gesture: she turned both hands to her Heart, and then stretched out her arms, like a Mother who urges her children to run to her and hug her. With reference to children: when speaking of sinners, Our Lady assumes a serious, grave look. Her look is still more severe, or I should say sad, when she speaks of the offenses we inflict on Jesus because of our sins. However, when she showed me Hell in the apparition of 01/02/87, her face was certainly serious, yet not upset: I saw no alteration on her face, as if she wanted to tell me that there was nothing to do any more for the souls who were plunged in that fire, and that their situation had stemmed from their behavior. When Mary was blessing, sometimes (particularly when she blessed objects) she did so stretching out her hands with her palms turned forwards and downwards, and sometimes she nearly made a sign of the Cross, without shyness, but discreetly, as she didn’t want to place herself above the role of the priests. I have ascertained this point more than once, since she herself reaffirmed it openly. When, on 08/12/87, she appeared in the church of St. Philip Neri Oratory at Acireale (Catania), she kept her hands clasped. Only at the end of her message, when uttering the words "Prayer, reparation, penitence", she separated her hands, and, pronouncing the three words, she lifted her hands progressively (as when one beckons a person to rise): in the meantime, her Immaculate Heart appeared. Among the mystical phenomena experienced by Rosario there are the locutions. This phenomenon is far less known than the apparitions. Maybe because this phenomenon is a more personal one (the Blessed Virgin had invited him "in a secluded place", 01/10/87), Rosario remained more reticent than ever about it. We know this phenomenon started on 07/10/87, the feast of Our Lady of the Rosary. Mary had informed him in advance, in the apparition of 01/10/87, that, on October 7, he would have received a gift from Our Lord. And she informed him with these words: "The Lord wants to grant you a special grace which is for the good of all his people".Now, this is precisely the definition of charisma. A charisma is an extraordinary gift, which has not been given for the believer’s personal benefit, but for "the common good" of the people of God. The locution, particularly the inner one, falls within the sphere of those gifts God grants us both for the common good and for personal edification of each individual. Rosario has had many locutions, even after the end of the apparitions. As to the procedure of these, he specifies they are not inner locutions: they belong to another kind of phenomenon, which the specialists of the mystical phenomena call auditory locutions. Rosario, in fact, claims the voice comes to him from the outside, clearly and unambiguously. The Bible presents famous examples of this gift: God speaks to Adam and Eve (Gen 3:9), to Agar (Gen 21:14-19), to Samuel (1 Sam 3:3-14). Apparently Rosario has had this kind of locution previously, that is when, on 04/05/86, the supernatural phenomena began. However, according to Rosario, the phenomenon started on 07/10/87. On that day this gift was granted to him officially, as an integral part of his spiritual endowment. Even Father Dino, the visionary’s first spiritual director, in a critical moment of his own faith in the Belpasso apparitions seems to have had one night (perhaps even some other nights) this type of locution. Concerning his own auditory locutions, Rosario states that the voice he had heard communicated only prayers. Later, starting from 01/05/88, the auditory locutions seem to have evolved. Rosario think this is a consequence of the promise Mary made to him that day, in order to encourage him to face the end the apparitions: "I will come back later in the future", Our Lady told him, "but this doesn’t mean that I have abandoned you; my Immaculate Heart will always be with you" (01/05/88). This was his reply: "A few minutes after the last apparition, my mood was the same as it has been after the other apparitions, although the Blessed Virgin has said ‘You won’t see me any more’. However, when I realized that I wouldn’t see her for a long time, dejection overwhelmed me while I was writing her last message, and when reading it, and even only thinking of it. That very night I felt a strong pain in my chest, as if a fire would devour my heart: I sent for a family friend who was a doctor, and she gave me some medicine, to no avail: the fire didn’t want to disappear. Afterwards I began to perceive that this condition caused me no pain: instead, it caused an indefinable pleasure and comfort. This pleasure reminded me of one past apparition: or rather, it made me feel the same way I felt during the apparition of 18/06/86. On that occasion Our Lady showed me her Immaculate Heart, and I felt the light of it inside and outside of me: I was impregnated with that light like a sponge plunged in water. I fully understood this new condition when I thought of what Our Lady had said after those words "I won’t come any more". In fact, she had said, as a promise: "but this doesn’t mean that I have abandoned you; my Immaculate Heart will always be with you". From then till today I feel the presence of this "spiritual fire", an inner one, which makes me aware of the closeness of Mary in my daily life, particularly in the circumstances which concern the events linked to the Belpasso rock". The evolution of the locution gift apparently fits in as a part of this phenomenon. Now the voice seems to come even more from the inside. In short, apparently the supernatural gift has changed from auditory locution to inner locution. In this dialogue, by the way, Rosario seems to receive counselling, illuminations, suggestions, both for persons and temporal situations, and for spiritual situations. Rosario intends to make these messages known when he thinks the right time has come: and this will probably happen when the events of the mysteries are about to occur. In the Belpasso messages, the words mercy and justice make reference to real periods of time. The time of mercy, from which we must profit before it is too late (since "there isn’t much time"), is the present one. And what about the time of justice? What has it in store for us? What will happen when the time of mercy is over? Perhaps we are not forbidden to be reverently curious and have a glance at the secrets, if Rosario himself, who must keep them, on the fifth anniversary of the apparitions (11/05/1991), has somewhat given a hint about their set-up and contents, stating by way of explanation "I have told you these things only to inform you, to make you aware of the many things you have the right to know". As far as the secrets are concerned, we know something from the messages, something from an official report, and something from what Rosario has replied to some questions. The secrets have been given to Rosario on 01/03/87. There are 12 of them. The addressees are Rosario himself (2 secrets) and mankind (10 secrets). the attitude and expressions of the visionary after the apparition of 01/03/87, and in the further accounts given by him. The words used by the Blessed Virgin leave no room for doubt. They are especially "unpleasant events" (01/05/98), "most serious chastisements" (01/04/87), "purification" (01/10/87). 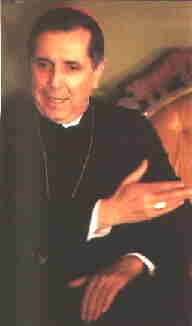 On 11/05/1987 Rosario stated: "Many have asked themselves whether these disagreeable events are to be very sorrowful. Just know that I cried for weeks, and maybe I wouldn’t have peace any more if the Heart of our Mother hadn’t consoled me and the Grace of Our Lord hadn’t assisted me". The messages as a whole let us understand that God has made a decision and fixed time limits: therefore the secrets are to be realized at any rate, they can only be attenuated (Rosario said "mitigati", mitigated). One can perceive this also from the sadness with which Our Lady announced and predicted that men will fail to follow her warnings: "Many will indulge themselves with their sins again, and will forget God and His Law" (01/05/88). and they are a purification to prepare the second coming of Christ. God gives men the capacity to purify themselves through a life of penance, sacrifice, fasting, and especially recourse to sacraments and prayer. Sins that draw chastisement are "superficiality" (01/02/88), "spiritual idleness" (01/05/88), "to have sold themselves consciously to worldly gratifications" (01/02/88), "forgetfulness of God and His laws" (01/05/88) and "indifference to Jesus and his sacrifice" as well (01/06/87). All these sins have their origin in our hearts of stone (01/08/87). The people of God, in particular, have a decisive role, as we have seen. By putting into practice Mary’s suggestions, one cooperates in "softening the hearts, that are now hardened ", in "purifying them", in "arousing spiritual zeal in them" (01/08/87) and in bringing them all to the unity of Christ and to peace. The secrets are part of the grand plan of God, which aims, in a new Resurrection, "to bring all creation together – everything in heaven and on earth – with Christ as head" (Eph. 1:10). It’s an acceleration of history toward the Parousia, that is the second coming of Christ. That the Lord shows that these secrets exist is an additional sign of the merciful love of his Heart and of His special predilection for his people. Toward the secrets we must not take an erroneous attitude. We mustn’t approach them with a hollow curiosity, or conceitedly, bearing in mind that God doesn’t open his Heart to the wise and learned (Mt 11:25). We must approach the secrets with respect, the same respect we owe to the will of God, who is the source. The triumph of the Immaculate Heart of Mary and the period of peace are a sign, among several other signs, that will reveal to the world the splendor not only of Mary, but also of the Church, as one might understand in the seventh secret. As to the time, one must say that the secrets concern this generation: the messages assert this implicitly, and the fact that Rosario is alive asserts this explicitly, since he himself was appointed to announce them. Nevertheless, we mustn’t fool ourselves thinking the secrets are imminent, between today and tomorrow. If we look at the Fatima secrets, in fact, we see that they cover almost a century, and are not yet totally realized. For instance, Rosario stated that the seventh secret is still in the distant future. On the contrary, we can think that at least the first three secrets are about to occur, since the triumph of the Immaculate Heart and the period of peace are near at hand. In his report of 11/06/91, Rosario declared that "the period of peace is close upon". Previously, he had given a precious explanation about it: "In the world there will be a period of peace. This has not occurred yet, because a more evident sign of the conversion of Russia is needed first: then peace will reign all over the world without exception" (November-December 1990). As to the addressees of the secrets and of the disagreeable events they contain, we know the secrets are addressed to all men (01/03/87), yet not in the same way. In particular, all men must go through this purification, since no one can appear without wedding clothes before Jesus who will return (01/05/88; Rosario’s report of 11/05/91). The Blessed Virgin, who had announced she would give a sign as a proof of her apparitions (01/01/87), now explains what this sign is all about: "Before all this occurs - that is, before the contents of the secrets occurs - I will inform you, so that you can tell everybody. This will be the tangible sign of my apparitions, the most important sign in heaven for its seriousness" (01/05/88). So Rosario will act again as a go-between, but this time to announce the future events. 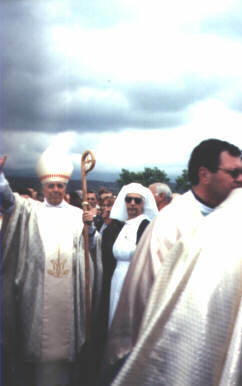 In the last of the great apparitions one can note this change: at Lourdes Our Lady gave three personal secrets for Bernadette; at Fatima three secrets (better to say, one secret in three parts), but allowing the Church hierarchy to reveal them or not to reveal them; at Belpasso, at Medjugorje and in the other apparitions of today the secret messages will be disclosed certainly and definitely. The Belpasso secrets are very closely associated among themselves. They are, like the Fatima secrets, a single secret divided in various parts that will be accomplished in the future. Only God can decide when to disclose the secrets, and his decision is in itself "a tangible sign", "the most important sign in heaven for its seriousness" (01/05/88). Why does Mary speak of "seriousness"? Because when the future events of the secrets are announced publicly, for many it will be too late. The set-up and the disclosure of the secrets for mankind (and also the number of 10) remind us in a very special way of the ten plagues of Egypt. Rosario says: "As to what will happen after the period of peace, we must remember that Our Lady will inform us beforehand and will protect us, if we follow her instructions on that occasion". "Now I’m full of hope in the goodness of the Lord. In fact, the Lord doesn’t intend to terrify his children, but only put them on their guard. Just think of Our Lady girded by a white sash: it’s a symbol that means we must always be ready. The Lord never abandons his creatures, his love for them is illimitable. 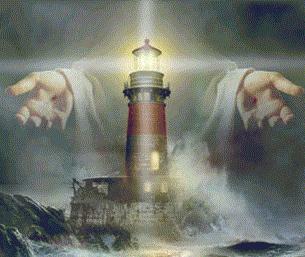 When the world is afflicted by unpleasant events near their point of culmination, a lighthouse will shine in the night: the seventh secret. About this secret the Queen of Peace has stated "it will be replaced by another event, which will be pleasing for all the people of God scattered all over the earth". In fact, Our Lady has stated that she will appear once again, and not only will she warn everybody, through me, before all this occurs, but she will come to protect us and encourage us when the trial is tougher, making me reveal the seventh secret, the secret of Mercy. However, this still looks so far, that we’d better recall Jesus’s words in the Gospel: "There is no need to add to the troubles each day brings". The mention of Mary "girded by a sash", the invitation to "be ready" recalls immediately to mind Jesus’ parables on vigilance, but also the night of liberation from Egypt, when the Lamb’s blood put on the doorjambs preserved the Hebrew people from the angel of death (Ex. 12.11). If we read attentively what Rosario says, we understand why the seventh secret’s scheme is the one that looks more like the pattern of the ten plagues of Egypt. The seventh secret will be like "a lighthouse in the night". This, more than many useless talks, should make us understand the gravity of the secrets. Like all other secrets, this too will be announced in anticipation; yet, Rosario says, "not only will Our Lady warn everybody, through me, before all this occurs, but she will come to protect us and encourage us when the trial is tougher, making me reveal the seventh secret, the secret of Mercy". This means the seventh secret’s disclosure will include indications, following which we will be protected and supported for the entire duration of the event: and that’s the reason why the event won’t be agreeable to everybody. Toward the end of January 1991, when the "Gulf War" had just begun, at Acireale (Catania), in St. Philip Neri Oratory, before a very limited audience, Rosario declared "this war also won’t last too long". At the same period of time, he reassured a lady about the secrets, inducing her not to worry, since at that point "we will be as though under an umbrella". The same thing happened for the Israelites during the ten plagues. We can particularly remember the plague of darkness and the plague of death of the firstborn. In the ninth plague, the Lord sent three days of absolute darkness, "but the Israelites had light where they were living" (Ex. 10: 23). The seventh secret is going to be an event that will display the glory of the Church to all the world. We have further precious explanations on this secret from Rosario himself. In order for me to avoid futile lucubrations and conjectures, one day Rosario told me that "something that was forgotten" would be restored. Concerning the people of God who will enjoy the benefits of the seventh secret, Rosario explained that "whoever comes back to the Church and leads a life of faith that reflects the light of the Gospel, can consider himself to be a member of the people of God". Subsequently, he confirmed what one could already conjecture from the message of Our Lady (see message of 01/03/88): "The seventh secret is more agreeable, not for all mankind, but for the people of God, which potentially can increase to infinity, just like the mercy of God that is infinite too". "Don’t think of disobedience against God’s commandments, or something that infringes the truths taught by the Church; rather one must think of something that was once in use in the life of the Church and then has been disregarded, but will come back into use, depending on the circumstances that will present themselves". And he made a comparison: "The sailor who, with his ship, is bound for a harbor doesn’t change his destination if the sea is stormy: instead, following the lighthouse, he doesn’t run the risk of losing his course, and gets assistance in order to reach the harbor more easily. Now, the sailor is the people of God. The harbor is the refuge, eternal salvation. The lighthouse is the seventh secret, which helps us reach the harbor more easily, and, in plain terms, the refuge." On March 1988 I asked Rosario whether, among the secrets, there was one that comprised a permanent sign that the Blessed Virgin would have left at Belpasso (she had made this promise on 01/01/87 with these words: "I will give a sign as a proof of my apparitions"). On that occasion Rosario was unable to reply. But in her last message Our Lady has stated the sign she has promised will be simply the announcement of the future events the secrets contain. 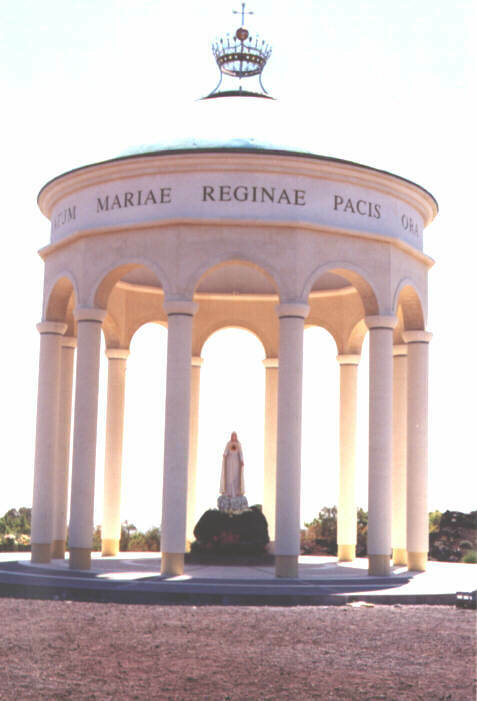 When I asked that question, I was thinking of the permanent sign that Mary promised she will leave at Medjugorje, and that belongs to the ten Medjugorje secrets. 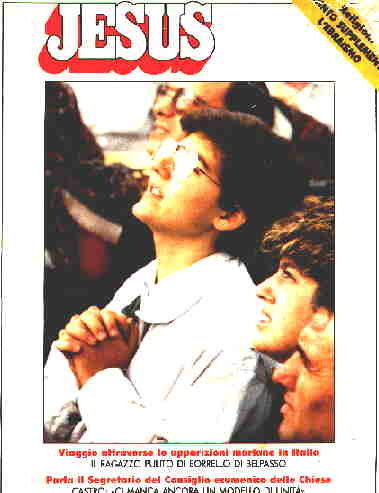 From Rosario’s reply and from what the Blessed Virgin says at Belpasso, one can surmise that, at least from this point of view, the Medjugorje secrets are not identical with the Belpasso secrets. After that, I asked Rosario whether, among the secrets, there was one that concerned Belpasso itself, and Rosario replied there was. On this subject, recently, while giving explanations on the seventh secret, Rosario dispelled my last doubts declaring. "Among the secrets there is one that concerns Belpasso; more precisely, one that gives a hint about things that concern Belpasso, but we cannot define it a sign. However, the Blessed Virgin will make use of a prophecy to give us a sign (01/05/88): and, since the secret about Belpasso concerns future events, only from this point of view can we call it a sign." We also have to say, concerning the secrets, that at Belpasso something like a combination between Fatima and Medjugorje will occur. The contents of the secrets will be delivered in writing to the local Bishop (a few at a time). Each document Rosario will give his Bishop will meticulously describe the events to come. The warning by Rosario will, instead, be a generic one, and will precede the events by a certain period of time. Rosario will say, more or less: "Be prepared, get ready, because the realization of such and such a secret is imminent". The proof will be in the document received by the Bishop. In addition to the things said above, we have to say that Sofia’s book stops at the first report by Rosario, dated 11/05/91. After that, Rosario wrote two other reports, one on 01/10/93 (It handles about an oral text in form of exhortation, which Rosario never get down in writing and for this reason, he never confirmed or signed any of the versions, which later circulated) and the other - which seems to be the last - on 11/05/99, both enclosed at the end of the messages. I advise you to carefully read the last report, and pay attention to the underlined points, because, according to what Rosario told me, they represent the will of God, and, moreover, they show clearly what we must do in order not to be caught unprepared when the future events take place. On the apparitions at the Belpasso rock, the Church has always assumed a careful attitude, as the Church certainly must do with such phenomena: yet the Church has always been clearly inclined to judge them authentic. In confirmation of this, the Archbishop of Catania, His Excellence Msgr. Bonmarito, has always kept a very close contact with Rosario, and, in many interviews, has defined the visionary "the clean boy of Belpasso" (see "Jesus" magazine, n° 5, May 1989), and has come to the rock many times, both officially and privately. "I had already heard about Rosario Toscano when I was Bishop of Agrigento. The alleged apparitions always occurred at midday, every first day of the month. Yet that strange rendezvous dumbfounded me, and the fact that people ran to the rock by the thousands impressed me. Just to give an example, from Burgio only, a tiny village of my previous diocese, one Sunday six coaches of faithful left for Borrello, a hamlet of Belpasso: in practice, all have gone to the apparition site, parish priest included. As soon as I had been made responsible for my diocese, I saw Rosario Toscano coming. We met three times, and we scheduled other meetings. I must say the boy is really clean. This is a real fact I have further ascertained in our meetings. Rosario is healthy, well-balanced, serene; he doesn’t like to attract attention. Once he told me literally: "How happy I am now that people no longer look for me, but go to the rock and pray to the Holy Virgin". He said that without realizing how important it was. …. He always told me: "If you want me to go to the rock and pray, I will; if you don’t want me to go, I won’t. If you want to establish the day in which I have to go, it’s O.K. with me". In short: he’s totally obedient. On 01/05/2000, the Archbishop has blessed the statue of "Our Lady of the Belpasso Rock", and has consecrated the chapel as a Marian sanctuary, attaching the Jubilee indulgence to it. Until today, each first day of the month the Belpasso Rock is visited by pilgrims (on the average, three thousand of them), who come by coach from all of Sicily and Southern Italy. The service begins at 10.00 A.M. with the recitation of the holy Rosary, songs and meditations on the messages, while everywhere, on the lawn, priests are available for confessions. At 12.00 A.M. (at 13.00 A.M. daylight-saving time), the celebration of the Holy Mass begins: all priests who are present and free from confessions take part in it. Then the pilgrims stop to pray at the Rock. Rosario doesn’t always participate at Mass, in order to avoid becoming the center of attention, as we have already mentioned. 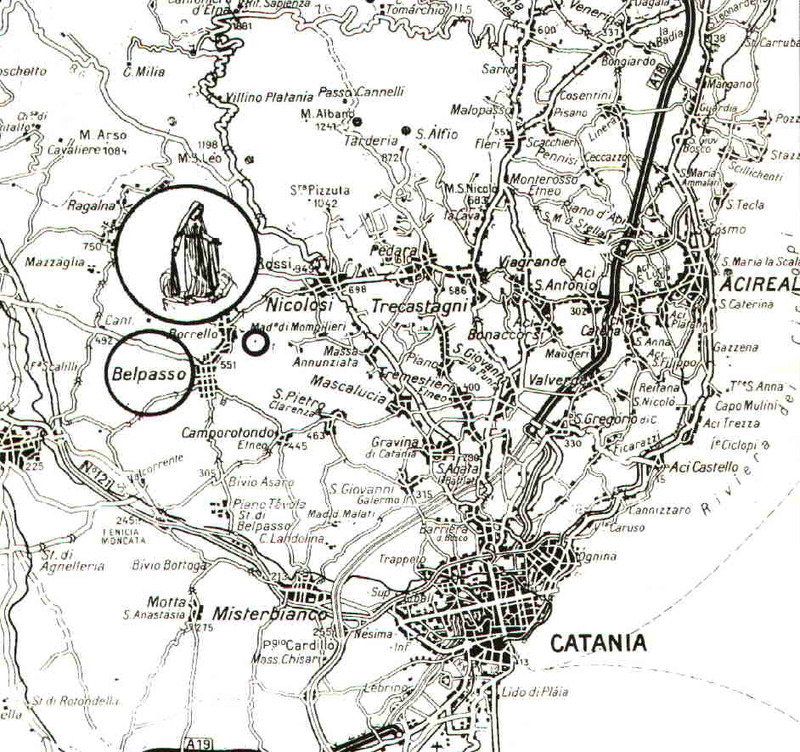 The arrival and stay of pilgrims occurs in the greatest order and interior concentration, thanks to the untiring work of the members of "Comitato Regina Pacis" ("Queen of Peace Committee"), whose president is Dr. Alfio Tomasello, an attorney: he has the assistance of many persons, among whom Mrs. Maria Calvagno, a journalist, to whom we must give credit for having prepared the final version of "Il diario di Rosario Toscano e i messaggi" ("The diary of Rosario Toscano and the messages"), a booklet that is invaluable for whoever wants to know the messages of Our Lady of Belpasso.